As autumn grows closer, our side dishes change from light to more hearty. 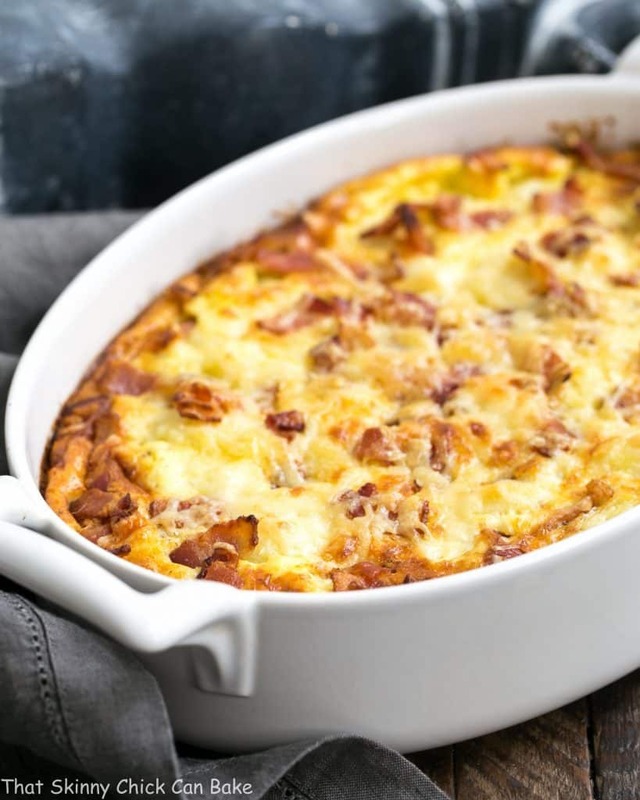 This cheesy Cauliflower Bacon Gratin is perfect when there’s a chill in the air, both comforting and delicious! I’ve gotten my picky family to eat by coating the florets with Parmesan and bread crumbs and popping them in the oven until crispy. So I was reasonably optimistic that they’d at least take a courtesy bite of Dorie Greenspan’s creamy, cheesy, bacon spiked gratin. 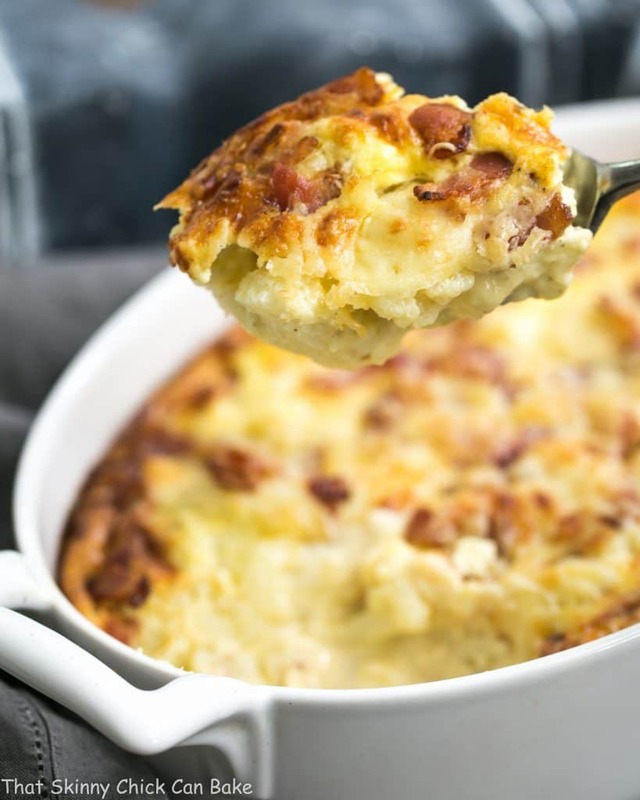 The first time I made this lovely side dish, I was an instant fan, but the rest of the family gave this cauliflower bacon gratin the cold shoulder. Bill gave it an OK rating, but was definitely not enamored with this side dish. I was willing to give it another try. Worst case scenario, I’d have to eat all 10 servings myself. The sacrifices I make! Well, what do you know. I didn’t mention to Bill that this was the second go around for this gratin, seven years later, to be exact. Surprisingly, his tune has changed and the hubby was a huge fan. He seriously loved this cauliflower gratin, especially the real bacon strips strewn across the top. Maybe his palate is finally maturing! 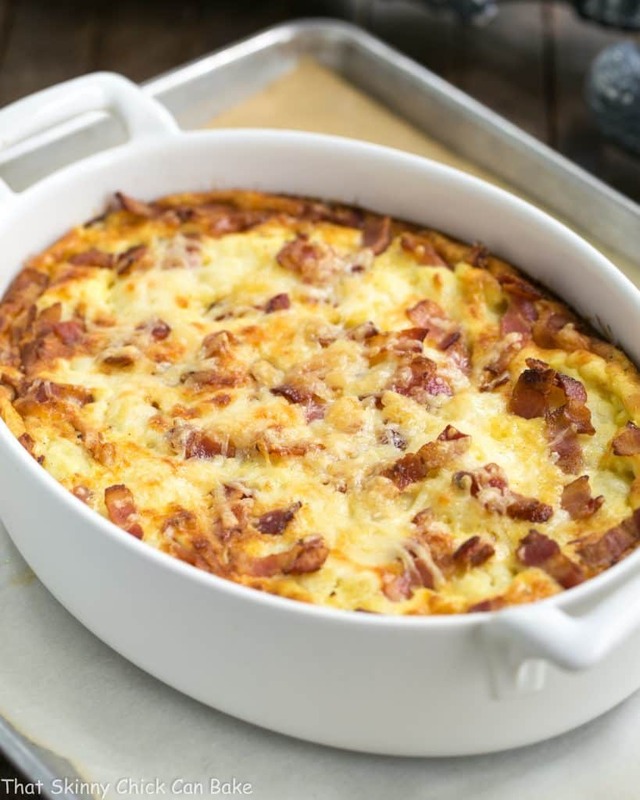 The cream, eggs, flour and Gruyere puffed in the oven to form a rich and elegant base for the cauliflower pieces. Rustic and beautiful, this dish would be perfect on a holiday buffet or for a weekend side dish. I even ate the leftovers cold. That tells you something, doesn’t it??? Preheat the oven to 425 degrees. Line a baking sheet with parchment paper. Butter a 2 1/2 quart baking dish and place on the baking sheet. Cut the cauliflower into florets, leaving about an inch or so of stem. Drop the florets into salted, boiling water and cook for 10 minutes. Drain in a colander,then run cold water over cauliflower to cool. Pat dry. Add the bacon strips into a skillet and cook over medium heat just until the bacon is browned. Remove to a paper towel lined plate to cool. Place the cauliflower in the prepared pan, and top with the bacon bits. Put the flour in a bowl and gradually whisk in the eggs. When the flour and eggs are blended, whisk in the cream and milk. Season the mixture with salt, pepper and nutmeg, and stir in about two thirds of the cheese. Pour the mixture over the cauliflower, then top with the remaining cheese. Bake the gratin for about 25 minutes, or until it is puffed and golden and a knife inserted into the center comes out clean. If the top needs more browning, place under the broiler for a minute or two, watching carefully. Recipe is best served warm on the day it is made, but it can also be served at room temperature, like a quiche. You may use ham cubes instead of bacon, add other vegetables or even herbs. If you have leftovers, reheat gently in the microwave after bringing to room temperature. This also makes a wonderful entree, served with a green salad.